From my early days as a classroom teacher for grades 5 and 6 in Pickens, West Virginia I observed how adding tables and moving desks changed the dynamics of classroom instruction. Recently I had a chance to visit the Westmoreland Intermediate Unit (WIU) in Greensburg, PA. The WIU converted a computer lab into a Maker space. Computer desks were replaced by flexible furniture that was grouped into clusters. According to Tim Hamill, the Curriculum Services Director at the WIU, simply changing the furniture created greater interaction at curriculum meetings. Whereas people in the past sat at their desk and seldom volunteered to talk, now there was a different dynamic – people were sharing their ideas in small groups and then providing the small group sentiments to the larger group. Elizabeth Forward was the first school district I visited to really embrace the transformation of a library into a digital media space. The library had limited use by students. With the transformed space that included a sound studio, TV studio, and cafe for students to hang out, the digital media space soon became the place for students to study and collaborate. Other schools soon followed in their attempt to make learning more social and informal. 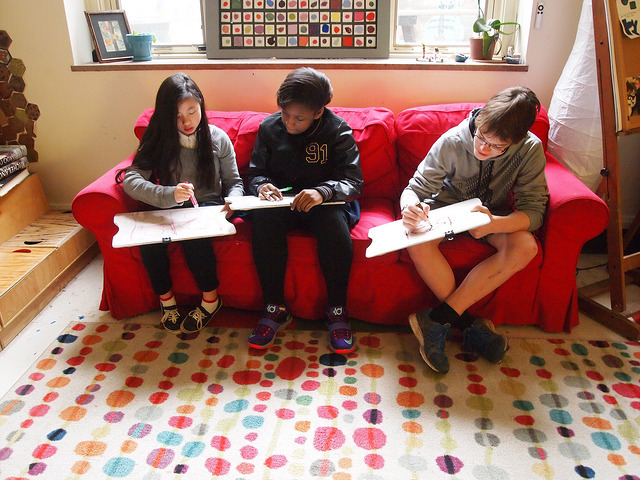 Instead of a room filled with tables and desks, schools, like the Environmental Charter School, added couches for students to work collaboratively. Three summers ago I went to the national Flipped Classroom Conference outside of Minneapolis / St. Paul. As I walked around the pre-conference workshops taking photos I realized there was a totally different learning experience happening in the rooms where people sat in rows versus classrooms with clusters of desks or tables. I pointed this out to Aaron Sams, the co-founder for the event. He decided to do his own walking tour and discovered the same pattern. For years research has shown that one-on-one tutoring is the most effective form of teaching. The English have known this forever and it’s the key to institutions like Oxford or Cambridge. In recent years we’ve turned to computers to make this happen. It doesn’t require technology, but when you have a classroom of 25 or 30 students you need something to help this happen. In my early days of teaching in West Virginia I used peers to make this happen. In the 1970s we didn’t have the technology, but I had students who could work with their peers to address issues while I worked with larger groups of students. At Carnegie Mellon University (CMU) I had the opportunity to discover the work done by the Cognitive Tutor team that became Carnegie Learning and then the Open Learning Initiative. The Rand Corporation did a major study of the Carnegie Learning system’s math tools and they agreed. Computer based feedback did make a difference. Why? Carnegie Learning, like a good teacher, provided frequent feedback. Students knew when they were successful or they were given suggestions to improve incorrect steps. If the student continued to have a problem, the software found a path where the student had previous success. The role of teacher changes, but does not disappear. The software makes the feedback loop quicker and provides data for the teacher to then make decisions about the student learning. At CMU I discovered a tool, Classroom Salon, developed by Ananda Gunawardena from the Computer Science department and David Kaufer from the English department. The CMU team discovered the power of social learning using data analytics. Classroom Salon allowed instructors to flip the learning. I could have students read articles, view videos, or interpret graphs ahead of class. I could use the information as feedback about what students already understood or needed to learn. From my early days of teaching I quickly discovered that when you provide choices to students, you change the learning dynamic. When I first started teaching we called it “Individualized Instruction.” As a teacher I made the choices for students. During my tenure at the Fox Chapel Area School District (FCASD) as the Coordinator of Education Technology we focused on Differentiated Instruction. Again it was about the teacher determining the best groupings and opportunities for students. In both cases I knew there were some positive gains, but something was missing: student agency. While teaching at CMU I had a chance to teach a course where I focused on Personalized Learning using Technology. I came across the work of Barbara Bray and Kathleen McClaskey. They honed in on the differences between what I had seen and where personalized learning really could go when you let the learner make their own choices. Today the Summit Public Schools with a little help from their friends at Facebook have created software to move in this direction. Was it possible to differentiate without software? Yes, but the number of hours and amount of energy necessary is overwhelming. At FCASD I worked with a team of educators who were part of a project called ALEM (Adaptive Learning Model) from Temple University. The program had many merits, but it was not scalable. Today with technology we have the possibility to make learning truly personalized, but we have to start with the understanding that the learner must be in control of many of the choices. For younger children teachers, parents, and other supports will be part of the process. Even at the college level there are needs for supports. However, if the learner doesn’t truly have responsibility for their learning, the learning is not intrinsic. Again we have years of research to indicate the value of intrinsic learning. While working West Virginia I came across the work of Seymour Papert. I become a Logo convert. I believed every child could construct their own knowledge and use the computer as part of the process. Today we call this computational thinking. I’ve been fortunate to see how the South Fayette School District has used Computational Thinking to empower student learning. Today we are moving towards Design Challenges where teams of student consultants solve real world problems. Each team takes on a role based on the challenge. The student consultants work collaboratively to creatively produce a product that solves a real-world problem. I’ve worked the past year with the Energy Innovation Center and Parkway West Career and Technology Center to coordinate a series of Design Challenges. 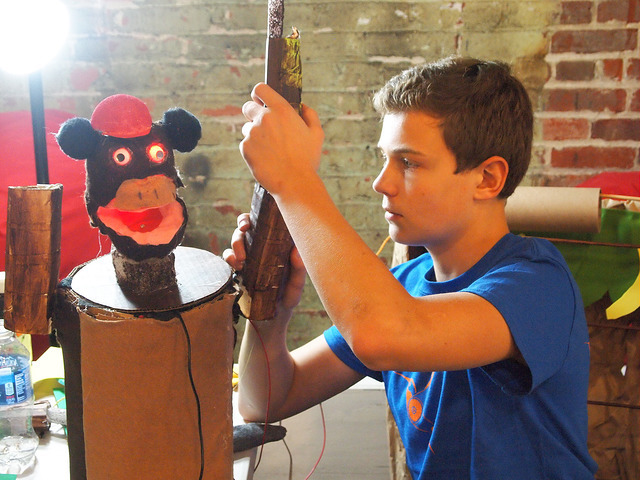 I have observed students at work at Hummingbird Makeathons, where older students are challenged to create robotic pets to interact with younger children. I’ve seen the value for all types of students. I’ve always believed that what I did as a Gifted Coordinator was applicable for all students. Build on student successes and interests! Let every student become a creative producer.